So, it is a really busy time for many activists at the CND Vienna this week -and it should start with no less than a massive shout out and major respect for our incredible peers and allies in the field of drug law reform and harm reduction, who do so much in the lead up and at these events - in ways that are not always seen by others. For our peers in particular, they bring with them so much more than 'an agenda' on where to intervene in the discussions that occur here. They bring their lived experience - every death, every incarceration, every bit of urgency facing all their peers back home - they - we - bring the power of humanity, of truth, of insight into drug use, communities of PWUD and the reality of drug policies and its effects on cities and towns across the world. Sometimes one can think that the work that happens at events like the United Nation's High Level meetings, and, in Vienna this year - the Commission for Narcotic drugs -are so far disconnected to what happens on the ground for the average illegal drug user -that the process can and has found Itself criticised as not having the sort of impact that really makes a difference in the ground where it counts. Things DO change - even at the UN! But the thing is - it does make an impact - you just need to look at the HIV movement and the incredible impact early and current activists have had - and continue to have -on the global state of health and HIV/AIDS. Human rights have seeped into actual health systems in a range of countries, so much of it thanks to the blood, sweat and tears of activists and civil society around the world who come together to events like this - with government officials and then, the many more who follow through on the grassroot implementation of harm reduction and empowerment projects and policies in their home countries. This is reflected in the grassroot and political organising of our movement. When the right terminology gets carried through in resolutions made at the CND, it allows for activists to push much harder at home. They are able for example, to use the terminology signed up to by their own government, to legally and much more powerfully push for those changes or implement projects backed up by the very terms signed up to, sometimes even with the technical support and the funding of UN agencies like the UNODC and UNAIDS. Resolutions get passed at these kind of UN events that have a knock on effect in ways many don't always witness first hand, but they DO make an impact which is why people from Civil Society put so much into the work that ensures resolutions are the best they can possibly be - by informing, discussing and working to enlighten their own governments . Just as important is finding ways to encourage governments to act by stopping or watering down the worst ones that often a smaller group of countries (usual suspects like China, Russia, Japan, Iran and often, although not always, the USA amongst a few others) are just as determined to push through or prevent -are rebutted, dropped or watered down as much as humanly possible! An incredible and often depressing world of Machiavellian politics! 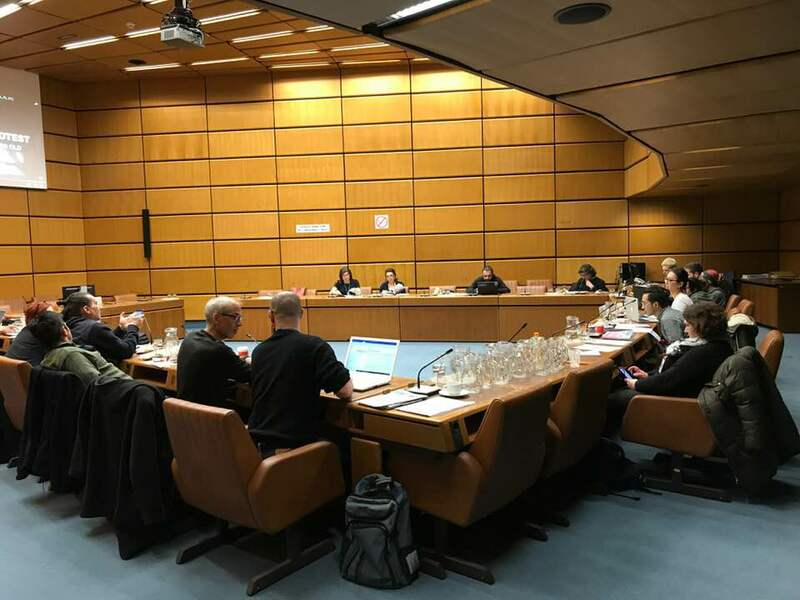 The community of PWUD's who were at Vienna CND in 2018 getting down to work. Organised by INPUD and IDPC and attended by PWUDs from all over the world. There are more drug user activists meeting at the CND this year than ever before, which is worth celebrating. The average politician rarely meets a person who uses drugs, (in the traditional sense of the word) and never really gets to learn anything about them aside from the role/stereotype we may inhabit at the time of meeting, which is usually as the victim or the criminal. Yet, for PWUD who are actively lobbying on drug related issues behind the scenes, the opportunity to discuss or present issues from our perspective to officials -is an essential part of helping to break down the barriers between us. Stigma and the resulting discrimination from drug use is extreme in many peoples minds, but conversations had with government officials at events like this, can really help chip away at peoples ignorance. In many countries, government officials are just not used to seeing drug users holding their own in these relatively high level environments and its important they witness our community in action. Indeed conversations held at the right moment can even lead to the odd epiphany for a politician! It does happen! Things do change, slowly but surely and the CND in Vienna this year just reaffirms my belief that things ARE moving forward front on the drug policy, however slowly it can feel at times. Things are far from perfect however, but considering that 10 years ago, civil society couldn't even get their foot in the door at what were all then incredibly private and hushed discussions, it is today clear to see just how much things are changing for the better -and just how much work and influence so many people across the world have continued to have -often in the face of overwhelming odds -in the name of healthier drug policies and drug law reforms, for all of us. And while it is true that the whole of the United Nations runs on diplomacy and diplomatic relationships which can mean a lot of stuff gets discussed and sometimes agreed in the lead up to these events, often in secret - (for example, there has to be complete consensus by member states, that is 100% consensus from every one of the 196 member states for ANY resolution to get passed - it can make for a very slow process - and it certainly it makes for very hard work to ensure the resolutions are at least acceptable and hopefully useful to the global community of people like us. It also makes for huge irritation and frustration when important decisions relating to drugs and PWUDS, such as the UNODC's Global guidance on Drug Treatment for example, which gets written without the most important people properly and meaningfully involved - us! (More on this issue later -but the people have fought back on this and it is now not the end of the issue by far! Stay tuned! ).There maybe even be a rewrite occurring!! But for the first blog about the importance of these events, we have to say that the changes here in the last decade have been huge - since Civil Society -our peers and colleagues for the drug law reform and harm reduction movements -got much more strategically involved in what happens here in greater numbers than ever before. The language and direction in resolutions and conventions have eased up considerably from a decade ago when it was only just becoming possible to have drug use seen as a health rather than a criminal issue and harm reduction was a term that was widely feared and loathed! Not any longer, although harm reduction is still a term that has a hard time getting into UNODC documents! But just to look back 10 years at how the UNODC (under Antonio Costa) described 'drug addicts' and his refusal to accept what effects punitive drug laws have on a person who uses drugs, and you will see a huge change indeed. I will update us more in a part 2 to this blog. At the same time the CND have been consistently pressured by civil society to start releasing their grip on the privacy of these type of events and discussions and the input permitted - we have visibly moved forward in certain areas. Nevertheless - there are still many, many issues for our community and others to fight to change here at the CND and UNODC, and back home with our National Country Coordinators (for the UNODC) -and this fight will go on,-in the meantime follow the blogs from IDPC, the CND and your country's delegation and user networks to find out all about the work going on here and upcoming, in the 2018 Vienna, CND.